1. Minimize distractions – Make it as easy as possible for your child to focus during homework time. Don’t have the television on in the background and make sure phones, tablets, and games are put away. This will also help signal to them that homework is a priority! 2. Create a homework space – Designating one place for homework helps establish a routine for your child. They will know to take their assignment from their backpack, bring it to the homework space, and return it to their backpack when they’re finished. 3. Recognize your child’s abilities – Some children need to come home and work on their homework right away before they start playing and lose track of time. Others need a break after a long day at school and benefit from a little down time at home before starting their assignments. 4. 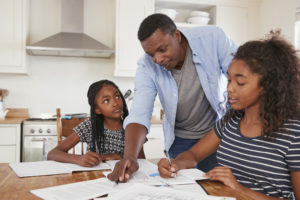 Connect it to the real world – If your child complains of homework being boring, try to emphasize how they will use what they’re learning outside of school. Not only can this help increase motivation, but it also shows how what they are learning this year builds on what they learned last year and already know. 5. Review, review, review – Remind your child that checking their work is part of doing homework. Reviewing after completing problems is not optional, and is actually part of every assignment. 6. Don’t get frustrated – You may need to give your child multiple reminders about the steps involved in doing homework. Especially when starting a new school year or coming back from long breaks, it can take a little time to get back into an after-school routine. 7. Remember who the student is – Find the line between helping your child with their homework and completing it for them. Remember that sometimes the takeaway from the lesson isn’t the answer to the problem, but your child learning how to problem solve and find the answer. 8. Talk with the teacher – If your child is working on their homework all night and can’t get it done before bedtime, set up a meeting to talk with their teacher. Many teachers are able to alter assignments to make the amount of homework each night more manageable for your child. It’s better to talk sooner to ensure your child gets the help they need before falling too far behind. Try these ways to help support your child as they do their homework. Use these ideas to help make homework time easier! Want more tips for your child’s development? Did you know exercise can actually help your child in school? Read about exercise benefits besides fitness. Reading for fun helps your child too! Get tips for boosting your child’s vocabulary and communication with books.